Analyzing the lack of a vertical threat, inconsistent combo blocking, and a sensational defensive performance. 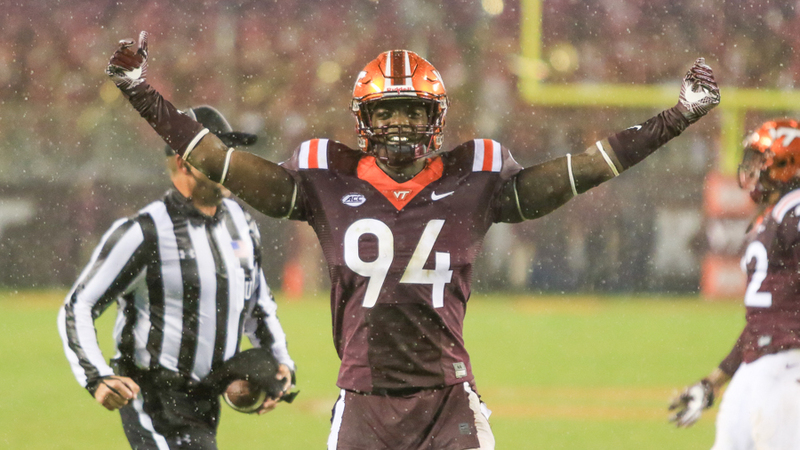 As ominous skies threatened Blacksburg, the Hokies faced a dangerous trap game. The opportunity to face undefeated Miami loomed on the horizon, but Duke, 2-2 in the last four against Virginia Tech, stood in the Hokies' path. The Blue Devils entered the game struggling offensively. However, a dangerous defense coupled with capable quarterback Daniel Jones made the Blue Devils much more dangerous than their record indicated. Instead of playing down to their opponent, the Virginia Tech defense and special teams delivered a standout performance. Time after time, those units provided the Hokies' young offense with a short field. And while the Hokies' offense often found themselves with the ball in Duke territory, Tech struggled to sustain drives. The lack of efficiency when opportunities in the vertical passing game presented itself allowed Duke to focus on stopping the Hokies' running game. Despite these challenge, Josh Jackson, Sean Savoy, Eric Kumah and the offense responded to a short field at the end of the half with a beautiful two-play drive that showed the promise of "what could be" once the offense can establish some consistency in the passing game. Duke runs an aggressive blitzing defensive scheme that produces a ton of negative plays. Duke tallied 68.0 tackles for loss this season, and is tied No. 18 nationally with 7.56 TFL per game. Sustaining long drives would be a huge challenge for any green offense. When the weather and negative plays factored in, a slog was in the forecast. The pattern played itself out predictably. Virginia Tech managed to break some nice runs when they got a hat on hat and Duke's blitz ran defenders out of position. At other times, three-yard gains felt like a major accomplishment. Overall when the Hokies struggled in the running game, two principal factors hampered their success: lack of a vertical threat and poor combo blocking. Duke showed absolutely no respect to the Virginia Tech vertical passing game. The Blue Devils went press man-to-man and one or both safeties regularly flew into the box to support the run. Even when the Virginia Tech offensive line blocked a play perfectly, Duke would have one or two unblocked defenders in the box. Duke's strategy was evident from Tech's first offensive play from scrimmage. The Hokies faked a jet sweep to the left and then handed the ball off to Steven Peoples on a split zone back to the right side. The play was blocked well across the board. Dalton Keene isolates on linebacker Ben Humphreys (No. 34) in the bubble between Kyle Chung and Braxton Pfaff. Eric Gallo and Pfaff combo block and turn the pads of stud defensive tackle Mike Ramsay (No. 99). Gallo works his head outside of Ramsay to turn his pads and Pfaff floats off to cut off linebacker Joe Giles-Harris' (No. 44) back-side pursuit. Chung turns out defensive end Victor Dimukeje (No. 41). Keene delivers a solid block on Humphreys. Yet the play only gains three yards because two of the three Duke safeties — Alonzo Saxton II (No. 21) and Jeremy McDuffie (No. 9) — both converge on Peoples. Duke has an eight on six advantage while playing a deep cover three shell. Unless the running back wins against the safeties (which this group of running backs doesn't have the combination of size, speed, strength, and vision to do), the chances for success are limited. It is worth noting that had Jackson kept the ball, he and Savoy would've ran almost completely unencumbered around the left side. Duke completely disregarded Jackson as a running threat on the edge. I think you will see offensive coordinator Brad Cornelsen take advantage of that if teams scheme similarly to Duke in the coming weeks. With Duke flooding the box with safeties, there were opportunities to hurt the Blue Devils through the air down the field. Cornelsen attempted to take advantage of the Duke scheme a handful of times. Cam Phillips was able to cash in on a back shoulder fade on the opening drive of the third quarter. James Clark also managed to draw a pass interference penalty. Those limited successes did not hurt the Blue Devils enough to hold the Duke safeties. Take this 2nd-and-four for example. Josh Jackson has Eric Kumah one-on-one against press man-to-man coverage. Corner Mark Gilbert (No. 28) is tasked to cover Kumah and he's playing inside leverage technique. Kumah has a size (6-2, 220 vs 6-1, 175) and strength advantage, but cannot make the play. To the boundary, Saxton II blizes. That leaves Cam Phillips one-on-one with corner Bryon Fields Jr. (No. 14). Phillips runs a slant and go ("sluggo") and beats Fields cleanly deep. Jackson never even looks at him. This kind of missed opportunity allowed Duke to continue sending their safeties. The lack of sustained success in the running game prevented the Hokies from extending their lead. The most inconsistent part of Tech's running game is the lack of combination blocking consistency. For those new to the column, a "combo block" is a zone blocking concept where two offensive linemen double team a defensive lineman. Once the double team generates movement, one offensive lineman will peel off and pick up a defender at the second level (often a linebacker or safety). When the Hokies running game had success against Duke, the combo blocks up-front were sound. This inside zone to the boundary on 1st-and-10 is an excellent example. Pfaff and Gallo combo on defensive tackle Derrick Tangelo (No. 54). Pfaff chips down and turns Tangelo's pads. This allows Gallo to slide his head across to the outside of Tangelo. Pfaff then climbs to linebacker Giles-Harris and drives him almost ten yards downfield. Wyatt Teller does a nice job of picking up Humphreys on a blitz through the back-side A-gap. Duke doesn't have safety support because the Hokies have three receiving threats to the field which occupy two safeties. On top of that, Duke is robbering their centerfield safety on a potential RPO slant (which later almost produced an interception that Cam Phillips fortunately broke up). The end result is a nice 9-yard chunk run. Tech's combination blocking goes haywire when a pair of offensive linemen stay on their double team for too long. An example is this inside zone on 1st-and-10. Pfaff and Chung combo Ramsay (No. 99) aligned as a 3-technique, while Gallo and Teller combo 1-tech DT Edgar Cerenord (No. 92). Neither Pfaff nor Gallo slide off their block to pick up Giles-Harris. The result: one of the best linebackers in the ACC is unblocked in the A-gap. If Pfaff has responsibility to peel off on Giles-Harris, Chung bears some responsibility on the play. Pfaff's double team turns Ramsay's pads. However, Chung's contact point is the outside shoulder of Ramsay. If Pfaff peels off, Chung will drive Ramsay right into the hole. Chung has to take a flatter angle, and place his right shoulder inside of Ramsay and turn him to the outside. Given the weather, and the quality of the defensive talent at Duke, Saturday's output wasn't terrible. That being said, considering the number of short fields and turnovers generated by the Hokies' defense and special teams, the offense should have been more productive. The remainder of the schedule is littered with defenses that can pose challenges. Miami has athletic linebackers that can use traffic to avoid blocks and still fit their gaps. Georgia Tech's defensive line eats up double teams so middle linebacker Victor Alexander can stay clean. Pitt loves to press on the outside and force offenses to beat them vertically, and Virginia loves to send Quin Blanding into the box as run support. Establishing more of a vertical threat and becoming more effective on combination blocks are critical to improving offensive output over the remaining schedule. After a virtuoso performance versus North Carolina, the Hokies' defensive front completely negated the Duke read-option run game that has given Bud Foster fits the last two seasons. With the running game ineffective, Duke was forced to become one-dimensional and Trevon Hill, Ricky Walker, and the rest of the Hokies' defense dropped repeated hammer blows on talented quarterback Daniel Jones. With the running threat of Jones, the Hokies relied much less on the slants and whip blitzes that Foster called frequently against UNC. Instead, the Hokies used more individual edge speed rushes than I can recall seeing this season. A speed rush is only effective if the edge rushers can bend inside to the quarterback once they use their speed to get an angle on the offensive tackle. A good speed rush path looks more like an "L" than a "/." If an edge player cannot bend inside, the offensive tackle can drive them behind the quarterback's pocket, which leaves huge running lanes. Tech defensive ends at the end of the Beamer era often had terrific speed. Yet, they struggled to bend inside and finish plays. This often led to historic rushing numbers for quarterbacks on draws and scrambles. Trevon Hill had a monster game rushing off the edge. His ability to bend (much like Chris Ellis a decade ago) sets Hill apart. With Ricky Walker and Tim Settle caving in the inside, Hill is being blocked one-on-one and dominating. On this third-and-eight, both Hill and Vinny Mihota speed rush off the edge. Ricky Walker rips up and under left guard Zach Baker (No. 69). Hill's first step off the ball forces left tackle Christian Harris (No. 70) to turn laterally and face the sideline. Hill bends inside and rips under Harris' outside arm to keep from being pushed behind Jones. On the opposite side, Mihota beats RT Robert Kraeling (No. 77) cleanly with a rip move. Hill hits Jones from behind and Mihota delivers a violent shot to Jones in the chops. To his credit, Jones stays on his feet until Walker, who fights through a blatant hold, comes in and cleans up. Throughout the game, Hill and Walker generated pressure. Houshun Gaines also got significant playing time in place of Mihota and also created pressure. The pressure and strong coverage combined to stymie Jones. He completed just 10 of 24 passes for 84 yards, no touchdowns, and 1 interception. There were only two coverage busts all game; the scramble drill completion to Johnathan Lloyd for 41 yards, and interestingly, the Terrell Edmunds interception. On the pick play, running back Shaun Wilson (No. 29) heads to field-side flat after a pitch fake. Andrew Motuapuaka follows in coverage. Terrell Edmunds bites up to the flat, which left Mook Reynolds without help vertically. Reynolds gets caught a bit flat-footed as WR T.J. Rahming (No. 3) stutters from the slot and breaks deep. Reynolds and Edmunds should be dead to rights. Reynolds does a great job to catch up to Rahming (aided by a slight jersey tug), and Edmunds demonstrates spectacular speed and range to get back into the play. Honestly, I am not sure how Edmunds was able to recover like that. You won't find many NFL safeties who can be that out of position against a vertical route and still work back to the middle centerfield like that to pick off a throw. Significant running lanes were created for Jones as a result of both Tech defensive ends frequently rushing wide on passing downs coupled with Walker's favored outside rip move. As the game progressed, Duke made an adjustment to take advantage of this pass rushing approach. On this 3rd-and-8, Duke responds to the speed rush with a 16-yard quarterback draw. The adjustment is the path of the tailback. Instead of Wilson isolating in the hole where Jones would run as most QB draws do, Wilson takes a step forward and then angles to the right, away from the hole where Jones plans to run. Rover Reggie Floyd and Tremaine Edmunds got caught leaning in the direction of Wilson's block. Edmunds gets sealed inside, and Floyd is well out of position. Schematically, Floyd should be reading the leverage that Edmunds uses to take on the block. Floyd likely should be attacking the boundary flat and filling the space between Edmunds and Hill off the edge. This was the second time Floyd got sucked inside on the exact same play design on the drive, and Foster was noticeably livid on the sidelines. However, unlike some of the Foster defensive units at the end of the Beamer era, the Tech front-seven was able to shed blocks and make plays in space which for the most part curtailed Jones running free. Outside of the two quarterback draws that popped open, Tremaine Edmunds was absolutely terrific in shedding blocks and making tackles from hash mark to hash mark. For example, on this draw, Edmunds is engaged with Duke's best offensive lineman, center Austin Davis (No. 50). Edmunds gets good extension on Davis and keeps his inside shoulder free. When Jones makes his cut to the left, Edmunds sheds the block and makes a beautiful one-on-one tackle. The way Foster's defense is supposed to work is to scheme the ball carrier to an unblocked defender who is then responsible to make a tackle. It is an outstanding play when a defender tasked to funnel the ball carrier actually sheds and puts the runner into the turf. This is terrific football by Edmunds. Ricky Walker had several of those wow moments as well. One of my biggest frustrations in 2015 was consistently watching defensive linemen like Dadi Nicolas and Luther Maddy successfully slant and penetrate into their gaps, yet not be able to resist down blocks and get washed away from the play. When you go back to those 2015 film reviews, I was constantly stating that, beyond the fit, at some point those defenders have to resist the block, cross the blockers face, and make a tackle. In a downpour, Duke tried to rekindle those bad memories by calling on the exact same play that caused so much of my consternation in 2015; a quarterback power. Walker had none of it. Before the snap, Walker shifts over into a four-technique on the right side of the defensive line. LT Gabe Brandner (No. 76) tries to pin Walker to the inside as Walker shoots the gap, and RG Zach Harmon (No. 63) pulls across to kick out Trevon Hill. Hill gets a great first step and disrupts the play. Instead of being washed inside, Walker fights back to his right to stay square on Jones. Jones has nowhere to go but to curl up inside Walker's arms. I enjoyed most of this game quietly and comfortably from my own couch. When Walker stuck Brandner's down block on this play, I got up and screamed like a kid in the North End Zone. That is tremendous work from Walker and Hill. The winner of Virginia Tech-Miami will find themselves in prime position to represent the Coastal Division in the ACC Championship Game. I normally see ghosts behind every tree when it comes to scouting potential matchups for the Hokies. However, I am quietly confident about how the Hokies measure up to the Hurricanes. Miami has three terrific wide receivers in Braxton Berrios, Ahmmon Richards, and burner Jeff Thomas. Tight end Christopher Herndon (30 receptions, 331 yards, and 3 TDs this season) is the best receiving tight end that the Hokies have faced. He can cause problems as a vertical threat. He will be a big challenge, especially for Reggie Floyd. The Hurricanes average 14.39 yards per completion. Limiting big plays will be critical. Despite those challenges, in 2016 many of these same Hokies (with a decimated defensive line) were able to completely disrupt the Hurricanes' offensive scheme with the same personnel and a better quarterback in Brad Kaaya. Malik Rosier is a good athlete who can escape the rush. However, he isn't particularly efficient (56.7 completion percentage). Rosier is also dealing with a shoulder injury/soreness. If the Hokies can limit big plays and force Rosier to stay in the pocket, I don't think Miami can sustain drives. Defensively, the Hurricanes have some serious athleticism. Defensive tackle Kendrick Norton can eat up blocks and still be disruptive. Sophomore linebackers Shaquille Quarterman and Michael Pinckney are huge and can run to the football on par or better than Dorian O'Daniel and Joe Giles-Harris. Unlike Clemson, Miami defenders have a tendency to run themselves out of plays, so they are also vulnerable to misdirection. I expect to see more screens, misdirection, and odd looking RPOs against Miami than seen against any other opponent. It will be a huge challenge for the young offense to find themselves and make plays against a big, athletic defense. This will be a game where protecting the football is paramount. Punting, especially when it flips field position, will truly be winning. If the Hokies defense can prevent big plays, anticipate this to game to be a tough, low scoring affair. I expect the defense to give the offense some three-and-out situations with a short field. If the offense can cash in a little more efficiently than against Duke, I expect Hokie Nation to be very happy come Sunday morning. French, you mentioned one play where if JJ had kept it, he had a lot of room on the edge. Seems like we saw several of those plays each game. Are the coaches not giving JJ the option to keep and run to the edge (perhaps saving it for later) or is JJ not making the read? The "bad" combo block video is also an example of the limited vision of our running back corps often have. The called gap wasn't there. Great running backs we've had in the past would have bounced that to the other side, where there was a huge hole and one man to beat to the end zone. Sometimes... hell, most times, the hole the play is called to deliver just isn't going to be there. The defense gets a say in it as well, and I think this example shows their line cleanly beating our line, taking away our ability to combo-block. At that point, great running backs make the play on their own. Not throwing shade on our current group. They are solid. But solid just doesn't get you the chunk yardage despite busted blocking assignments that we got used to for so long. There was one run in particular where McClease did have the vision to bounce outside and run around the left end on a designed run up the middle. I commented when I saw him do that, that our other RB's just would have ridden up inside for positive yardage of one or two yards and been satisfied. Did that earn him more playing time the rest of the night? Maybe. To me, it seemed like McCleese's TD was similar. Designed to go inside, but he saw the opening outside. Our collective of backs leaves something to be desired. Unless you have a dangerous passing team, defenses are going to get unblocked guys in the box. Your back has to win some of those battles. I don't think we have that back on the roster. I have been impressed with how Travon has started to run though. We saw obvious flashes of it when he was a freshman, and at time last year like against Duke, Miami, and Clemson when he looked less timid and ran through tackles rather than just going down at first contact. The last couple weeks he has had runs that showed that strength and motor. His vision and quickness isn't great and I agree he won't get chunk yardage that way. But it makes me happy to see those plays where he keeps his legs driving for extra yardage or runs through arm tackles that seem to take down everybody else in our backfield. Hey French, thanks for the review. When you were running through film review this season, have you noticed an inordinate amount of blatant holding calls on our d-line that haven't been called? You pointed to it on the Mihota/Hill/Walker sack, but I feel like especially the Clemson and Duke games our D-line was blatant held 8-10 times a game with zero total holding calls between the two. have you noticed an inordinate amount of blatant holding calls on our d-line that haven't been called? I'm no French, but it sure seems like there have been many holding penalties uncalled, pretty obvious ones in a number of cases. Yes, but it goes both ways. Our OL has gotten away with a few holds. There have also been some pretty blatant PI not called against our opponents and at least one horrible call against us per game for PI. I feel like our "vertical threat" suffered greatly from the pass interference calls, and maybe some that weren't called. it seemed like every time we went deep, there was some contact, or the defender made a good play. As French said, the PI on the Clark thrown really saved Duke from having to worry. Had that score happened, they would've been a bit more tentative. In the end, they just gave up a first down/yardage and were able to keep doing what they were doing. I watched Kumah, Phillips, and Clark all go for long routes, and none of them managed to come together the way we needed them to. It's not that we lack the ability/personnel for the threat. It just hasn't come together yet, and therefore isn't a threat. Particularly given the 2 bogus PI calls on our DB's, on one drive, late in the game. Yeah those refs need to review the "uncatchable" and "offensive pass interference" paragraphs in the pass interference section of their rule books. Funny part is that they clearly called a potential DPI against Duke in the 1st half as uncatchable. I remember it because I think that it's the 1st time, this season that I've actually see a ref use the "uncatchable" signal. Thanks again French. I feel like we have a good number of plays like that play where JJ and Savoy are completely free. It seems like our misdirection can work pretty well (not that this play was a misdirection but could be). The first play of the Clemson game is a good example. The misdirection off the fake handoff to McMillian gets the Clemson defense to bite hard but one player didn't buy it at all and their speed in general was hard to handle. I suppose the question is: What does it take to get these misdirection plays to work better? I'm looking forward to the Miami game! Really glad to see Tremaine being more consistent. I know after 2 or 3 games into the season you were concerned about his inconsistency in tackling and fighting off blocks. He's been looking really good the past few weeks. Any update on the injury status of Joshua Nijman? First day back in the office after three months on the road. I will respond to questions this evening. Keep them coming. French, what is the main difference between us and a team like Georgia that runs the ball at will? It seems like they don't even need a passing threat to dominate on the ground. I think it is the five motor graders disguised as offensive linemen. VT runs an inside zone read. The Hokies get hat on a hat across the front (five OL and Cunningham.) There isn't a bad block, and Cunningham particularly does a fantastic job getting movement at the point of attack. The rub is that Duke has two unblocked defenders that blocking can't account for. Humphreys (34) flies up and has enough speed where he effectively takes QB while still being tight to McClease. The FS (No. 13) takes dive. This is going to happen in short yardage no matter how you scheme. The elite RBs (Chubb, Michel, Barkley, etc) will, at least some of the time, shake that safety or run him over. That is the difference right now. It is in no way an indictment of the effort of our backs. But, physics takes over when elite matches up with elite. We have to get better at that spot. Thanks for the reply! Wasn't sure if it was just simply having dudes or something schematically, etc. Looks like... csi.gif ...stars matter. Talent matters. Sometimes guys with 5 stars aren't as good as advertised (love his effort, but JC Coleman was significantly overrated by recruiting services.) But, with the way teams defend the run now, if you can't get your back into open space consistently, he has to be capable of running over or by a safety. See what the Crawford kid did to Mook in the WVU game one time. It was nice seeing game in person and I was in the 2nd row. To me it looks like we were playing a bit cautious on offense. You could that we kinda emphasized ball security and played a bit vanilla. But on defense, you could see the tone set right away. players are fired-up yet focused. Our anticipation at the corner position is really good, top notch. Linebackers still need a little improvement. but D-Line is playing awesome, there were a few times Hill was in the backfield real quick. Hill's path to the QB is much better than earlier in the season, he was trying a lot of spin moves, inside moves and they weren't quick. Last few game, he's going out and curling into the QB, seems to be working much better. At least it looked good against Duke. Defense has only allowed 2 TDs in the past 3 games; both were in 4Q when game was out of reach. To me it looks like we were playing a bit cautious on offense. You could that we kinda emphasized ball security and played a bit vanilla. I imagine that was likely intentional due to the fact that we were playing a subpar Duke team in the rain, when our defense was playing well. No need to open the playbook or take additional risk. Is it just me, or is Mook a borderline dirty player? I love watching him, but I notice that when he gets up he has a tendency to get in the extra bump/shot, throws shoes, etc. He's the kind of player that you love when he's on your team, and hate when he plays for someone else. I'll take borderline dirty. Andrew Miller-dirty is my breaking point. It is amazing that he didn't get kicked out of at least five games in his career. I'd actually love to see more of our guys have the nastiness Mook's got. Glad I'm not alone here. I thought the shoe throw was hilarious. Then I realized if a ref sees it you can give the bad guys 15 free yards. Be nasty during the play, not after the whistle. "These people are losing their minds!" French, you mentioned both JJ missing Cam beating his man and almost throwing a pick into robber coverage, and I have seen a few other times he has thrown into double coverage when he had someone open. I expect this from a freshman, but have a couple of questions. Do you think some of this based on Fuente's heavy use of pre-snap reads? Either this is what Fuente is coaching at this point in JJ's development, or JJ is relying on pre-snap too much and post snap not enough and deciding where to go with ball to early? Or is it just a young QB developing consistency? You have talked a lot about the one read system, but i am still trying to understand how that fits into what I am seeing. Is it improving game to game? I can't destroy Jackson for the Kumah throw. He had man to man, so it was a good read. It just wasn't the best read in retrospect. But, I would like to think that a more experienced QB would identify the safety blitz and go after the one on one with his best WR. It didn't even look like JJ saw the right side of the field. Focused on Kumah. And while we are on him, I know you are high on Kumah but he looks like the guy who will just get pushed aside next year when Hazelton, Farley, Turner, Simmons and Patterson are available (and maybe Bush as well as he moves to WR as rumored elsewhere). Kumah's still really young, but he's not a true freshman. I'm just not seeing what it is about Kumah that will keep him in the rotation next year when the talent level spikes. I agree. I don't see staying at WR at VT long term. If he can't make a Diabloesque switch I think he will probably transfer. I think he will be a good player. Still reminds me a ton of Boykin. But, he doesn't time his vertical leaps well. He will be an underneath possession guy, where Farley and Turner are going to be more vertical. Hazelton is VERY similar to Kumah, just more polished as a route runner. Remember, Savoy's TD doesn't happen without a great throw from Jackson on a great route by Kumah earlier in the drive. The weather really didn't allow for many of those types of plays, and those are the kind of routes he should excel at. Kumah had a nice block on Savoy's first end around as well. No sauces but I'd have to imagine we see some transfers this offseason from some of our RB's/WR's. Those positions are gonna get really jammed up this offseason. challenge for any green offense. When do we stop calling them green? We are almost 3/4 through the season. When there aren't ~5 freshmen on the field at any given time. So not any time this year. I think if a freshman starts and plays most of the snaps at a position it is fair to expect them to start play like a more experienced player as the season goes on. Keene, Savoy, JJ and Bradburn are getting seasoned- but the rest of the receiving core and Holston are still pretty green. To an extent, but bowl practice + spring practice + offseason work + fall camp is a whole lot of development time, while week-to-week is mostly game planning and prep to beat a specific opponent. There's definitely some seasoning in terms of being used to playing college football, but I'd expect a bigger improvement after the '17 season. Unless you are playing the youngsters because even with their inexperience, they are still your best option. A perfect example is FSU playing a true frosh QB (3* even), because they're really aren't any other options. He's played virtually every snap since Franscois got hurt in the 1st game. Do you expect him to play like an "experienced" player? Nope. He's gotten better for them, but still makes Freshman mistakes. Still freshmen/R FR/first year starter at every skill spot except TB and Cam Phillips. I regard that as green. Two year starters are seasoned. I was so happy to see our D-lineman and linebackers take better angles to the QB this game as was mentioned. This was an issue earlier in the year wherein we could get into the backfield, but took horrible angles that made it easy for an athletic QB to step out of. Love to see the suffocating pass rush emerge again. Fuente just finished his press conference. He noted that the OL played much better (I agree) and that it was Teller's best game so far this year (I would say on par with WVU.) He also mentioned that he wants to see the RBs make these safeties miss. I am glad that I am seeing the same stuff on film that the coaching staff sees. I am glad that I am seeing the same stuff on film that the coaching staff sees. I'd send them an invoice for consulting services. If they needed a quality control staffer, I would listen for about $130K a year. They would have to ask nicely though. you just need to get yourself a job as a HS coach for the next Dwayne Lawson and you can make that dream a reality. He also said Peoples and Nijman are day-to-day; which is counter to the scuttlebutt going around yesterday that Nijman was out for the year. I trust his judgment, but it seemed odd. Was it the weather? Something wrong with Joey? Speculating - but I bet a combination of bad weather, Joey's struggles and how well our defense is playing. Thanks, I missed that. I guess that explains the one from the Duke 35 -- a 52-yard kick is outside Joey's effective range, which I think of as < 50. But he went for it twice at the Duke 23.
and the FG was right down the middle from about the same distance as the first 4th down. I was rather confused. I think the first 4th down was a momentum decision coupled with desire to stack up as many points as possible before rain set in. I also think Bradburne has struggled with holds all season. He even admitted to catching his punt snaps with his chest because he wasn't confident with slick ball. Personally I think teams should go for it on 4th more often anyway. Is it plausible (asks he, hopefully) that the CornFu playbook/offense has some pages that are just waiting to be brought out into the light of day? And that light of day could happen in the next 2 games when we will probably need them? The play calling has shown much more variety this year over last year in the running game. Having a mobile sledgehammer at TE helps. "a mobile sledgehammer at TE helps" Nice! Another great write-up! Thanks French! How has the play calling been this year? I feel like we haven't been working as many packaged play sequences as last year. (Show them a play/look over and over again then hit them the other way when they get used to it). The play calling hasn't felt as rhythmic as it felt last year (minus the WVU game). As a result I feel we're not as consistent. Maybe this is due to CornFu trying to push the development of our O more? Maybe I'm way off but it feels like we're doing more experimenting this year and less high percentage play calling. As noted above, I think the answer to this question will be completely different on November 25 than it is today. I think there will be a LOT of surprises over the next four games. At least, I hope so. So we haven't been able to stretch the field after 8 games this year. Are we going to be able to do it next year? Who will it be? I know we expected Farley to do it this year but it isn't always easy to come back post torn knee ligaments. Farley, Hazelton, and Turner (and hopefully a healthy Patterson) can all stretch the field. Then you have Kumah as a possession guy outside and Savoy as a vertical threat in the slot. Lots of possibilities. They need a guy besides Savoy on that jet sweep series. Pimpleton hasn't jumped out at me as elusive when he gets on the field despite his HS film looking amazing. He is a guy they will need. Otherwise, Fuente/Cornelsen may start going with two tailbacks with a McClease or Fox type in the slot on plays where they want to run. They need a guy besides Savoy on that jet sweep series. I really like Simmons tape, reminds me of Ford. Similar skills as Kumah, a guy who can catch the slants. Not super fast but good receiver skills. Gotta day given the conditions I was pleased overall with the play of the offense and once we put 17 on the board I think CornFu got conservative due to the weather and how the defense was playing. I think our offense will be ok as long as we take care of the ball on Saturday. UNC turned the ball over a handful of times as did Syracuse and Miami still needed the final few minutes to put those games away. We may get stung on a play here or there but I think if our defense plays as well as they have our offense will tire Miami out and start putting the game away late third early fourth. French - I saw you replied to someone on twitter calling GT dirty when they cut Lawrence on the third play. You replied "High - Low 101". Is that a legal play ? And well executed? I think it should be legal. But, by definition, it is a high-low chop block. Lawrence is contacted by one blocker, and the other is hitting him below the waste. But GT does it so much that the officials hesitate to call it. Also, officials are old like me and that was a legal block for most of their lives.